Tenerife Golf is an extremely important subject. The island is more than equipped to satisfy even the most particular golfer and boasts courses of international standing. There are nine in total. The second oldest golf club in Spain, the "Royal Golf Club of Tenerife" was founded in 1932. It has a charm about it that gives it a particularly British feel. Situated nearly 2000 feet above sea level, it possesses 18 holes of undulating fairways that are complemented by a spectacular view of Mount Teide. There are many hazards to overcome, such as dry stream beds and, at the 4th hole, you have out of bounds to the left and drops to the right. The course is dotted with large trees that afford some welcome shade, making for a thoroughly enjoyable experience. There is even a "halfway house" at the 10th tee, where you can enjoy a welcome break for a drink and a snack. The Golf Club features a restaurant and a Pro Shop. Situated at Buenavista del Norte. Designed by Seve Ballesteros, this beautiful Tenerife golf course is set between the impressive Teno Country Park and the coastline, with its rugged cliffs. It offers spectacluar hazards, with its close proximity to the sea making you feel like your ball may easily end up in there! With water features such as the large central lake and a waterfall, this golf course provides an enjoyable and challenging experience. Buenavista Golf features a Golf School and a Club House with stunning views of the entire course. Situated between Reina Sofia Airport and Los Cristianos. Ever since it's 1987 inaugural event, which was a competition for professionals, the 27 greens and fairways of Golf del Sur have provided the backdrop for various international tournaments. This Tenerife golf course, designed by Pepe Gancedo, later modified by Manuel Pinero, has a enjoyably challenging layout with the unusual feature of black volcanic sand in the bunkers. The wide fairways are lined with a lush selection of indigenous plants, plus palm trees and giant cacti. The creator of the course kept and enhanced all the natural protected areas that surround the 27 holes between the ravine. Particularly difficult is the 3rd hole of the course. To the right of the wide fairway is a water hazard, behind which lies an impressive ravine with an yellow rockface, while to the left is a gaping bunker of black sand, requiring a great deal of accuracy. Another notable hole is the 2nd of the southern course, a par 3 of 193 meters whose green is surrounded by another immense bunker of black sand. The club offers a golf school as well as practice facilities, a tennis court, lawn bowls green, bar-restaurant and pro shop. For groups, Golf del Sur has a special instruction area for practice and beginners' tuition. Groups can use their own teaching pros or the services of the Golf del Sur professionals. Situated next door to Golf del Sur, this Tenerife Golf and Country club is right by the ocean. The designer, Donald Steel, created an 18-hole golf course so close to the sea that you sometimes have to drive the ball over the water to the next green. None much more so than the 5th hole, one of the most spectacular on the course. Surrounded by barrancos (rocky areas), it is dotted with palm trees, cannas indicas, pine trees and other shrubs that not only make for a picturesque environment, but serve as natural obstacles. With spectacular views of Teide, this Tenerife golf club has a pitch and putt course, a swimming pool and a horse riding club. The challenging aspect of the course was noted when it was inaugurated in 1989 and it has since gone on to host the second part of the Tenerife Golf Open which is part of the famous European PGA Tour. The course is directly under the flightpath to Reina Sofia Airport, so be prepared to be distracted! The clubhouse closes at 6pm, prompt. Golf Las Americas is found in the centre of Playa de Las Américas. It is situated in a natural, gently sloping amphitheatre where you can look across the sea to the neighbouring Canary Island of La Gomera in the distance. This 18 hole Tenerife golf course has plenty of natural obstacles, such as lakes, streams and waterfalls and its designer, John Jacobs, makes full use of them. It is also protected from the wind by the range of hills which form its immediate surroundings and provides an ideal venue in both winter and summer. The club house, which is a fine architectural example, provides comfortable balconies offering excellent views of the course. Amongst services offered you'll find a bar/cafeteria, a pro-shop, bag and club custody service, buggy and caddy cart hire and a golf school. Part of the hotel complex Abama Golf and Spa Resort, we have yet another Tenerife golf course built to a professional-standard. Situated in a quiet area of Guía de Isora, the 18 holes were created by Dave Thomas and are dotted with 22 lakes and over 90,000 palm trees. Superb views are to be had of the sea and the island of La Gomera. There is a practice green of three holes and fresh fruit and water is available to keep you refreshed as you work your way round this Tenerife golf course. State-of-the-art electric golf buggies are available, with on-board GPS systems displaying detailed information about every hole, and a personal water cooler. The Club House includes dressing rooms, an outdoor rest and relaxation lounge and a shop stocked with a full range of professional golf equipment. 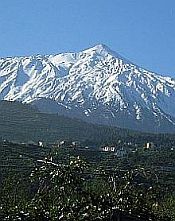 The course of the Tenerife Golf Costa Adeje is situated in an area called Los Olivos, which is north-west of Las Americas. You can reach it via the main TF-1 motorway, heading towards Adeje and exiting at junction 79B. It is one of the most impressive Tenerife golf courses on the Canary Islands. Occupying an area once covered with banana plantations, the designer kept and restored the small plateaux used in this activity, together with the numerous stone walls which divided them. These were integrated into the course, making for some interesting hazards. Golf Costa Adeje boasts an extremely well-appointed Club House, housing a fine restaurant, a large bar with equally large terrace, a sitting room where you can quietly relax and a Pro Shop. After 12 o' clock, only nine holes may be played. Only soft-spiked golf shoes are permitted. The Club requires a dress code in accordance with golfing etiquette. Centro de Golf Los Palos is a Tenerife golf course found near Las Galletas and is a more modest affair than the previous seven on this page. Only nine holes, it is ideal for beginners. Set in a lush garden on one level, it features a selection of water obstacles such as lakes and streams. It also boasts a Clubhouse with a fine terrace overlooking the entire golf course. There is also a chipping area and putting green where individual and group classes are given by a PGA professional in several languages. Within the Clubhouse you can find a restaurant, golf shop, plus a children´s play area. Tenerife golf course not on Tenerife! Found on the neighbouring island of La Gomera, near Playa de Santiago, we're counting this course as a Tenerife golf course because most keen golfers wouldn't be put off by a 40 minute ferry ride to get there. This 18-hole course, designed by Donald Steel, is positioned on a cliff, overlooking the sea and having impressive views of Mount Teide. There is natural vegetation on the upper slopes and it becomes more and more dense until it reaches the sea. It culminates in a beauty spot with an array of fruit trees. The natural geographic features are brought into play, with one hole requiring you to drive over a ravine. Another memorable hole has the tee some 45 metres above the level of the green. Tecina Golf also has a Golf School.